This topic contains 0 replies, has 0 voices, and was last updated by Mike Haldas 8 years, 4 months ago. I was thinking about doing a live wildlife cam like http://www.gadeercam.com. I have a question to ask. 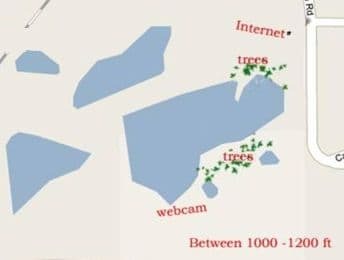 From where the camera would be to where I have an internet connection would be 1000-1200 feet across a lake and thru a line of trees. I have a power source near the site. What can you suggest? I am also including a map of the area to give you a better idea.